Place poles apprx 36 feet apart or as desired. Increase distance to increase game difficulty. Teams of 1 or more players. Place target on top of pole, try to hit your opponents pole or target to score points, one throw per team alternating. Each player must stay behind their pole at all times. This is a popular outdoors/indoors game. If you want a fun tossing game to play with 2 or 4 people, then get this Beerbee game! Also called Beersbie, Frisbeer, polish horseshoes and Beer Frisbee. 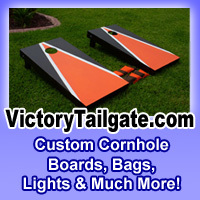 ( Sold via www.OutdoorGames.biz. It seems this model for beersbee has been discontinued. ) We love this game and it is great to have at any party or get together. A very fun tossing game!